We had an interesting visitor this afternoon when I came home from work. 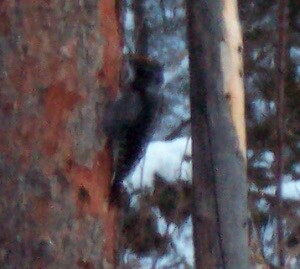 The sun had already set and all I had was by little digital camera, but the photos show a three-toed woodpecker on a dead tree near the house. It was banging away for at least twenty minutes before I went inside. 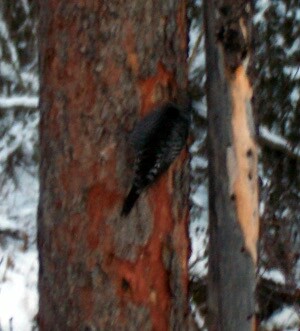 It (he) had a bright yellow cap, which is sort of visible in the photos, and you can see the barring on the back which distinguishes him from a black-backed woodpecker. Very cool. Earlier Nika was out in the dog yard with Deuce, barking up a storm near the dog shed. 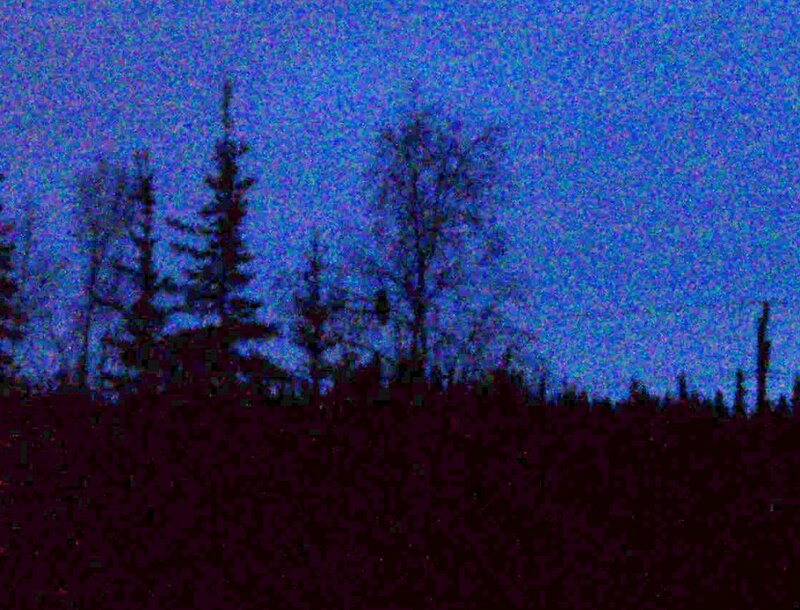 It was starting to get dark, so I couldn’t really see what she was barking at. I wanted a beer anyway, so I got my boots on for a walk out to the red cabin. About a quarter of the way out there I heard a strange screeching noise. 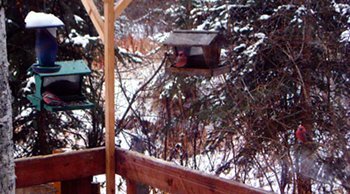 At first I thought maybe it was moose antlers rubbing on metal behind the dog shed, but when I looked where the sound came from I saw a great big bird in the birch tree behind the sheds. Raven? Then it turned it’s head, looked at me and started moving it’s head up and down, back and forth, probably trying to figure out what I was. 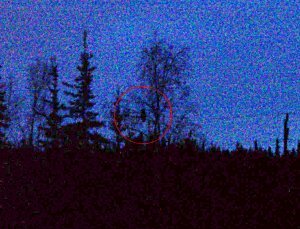 The photo is pretty bad, but it’s a great horned owl. Honest! The camera has an ISO adjustment feature, which might have helped a bit, but I didn’t want to mess around with the settings too much in case it flew away. I snapped a couple photos and then watched it through my binoculars. After a couple minutes of looking around, it saw something over by the red cabin and flew over there. I’d heard great horned owls calling at our old house, and thought I heard one here a week ago, but seeing one so close to the house was a real treat. 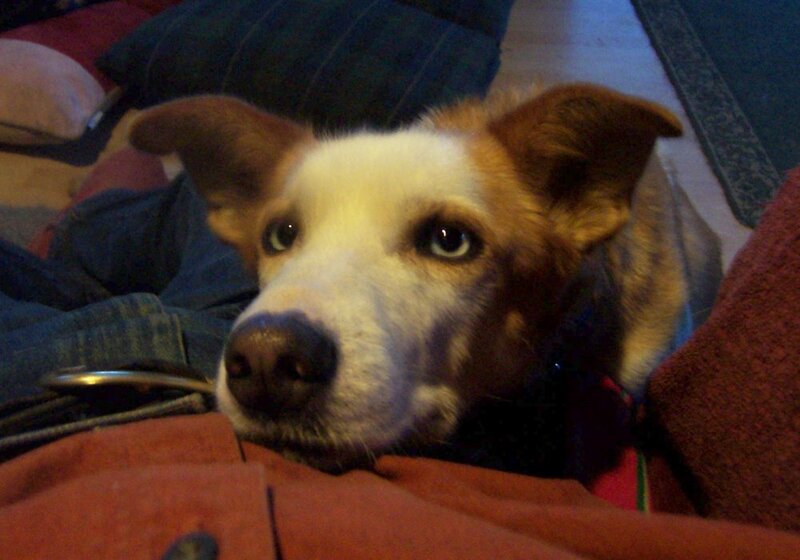 Meanwhile, Piper wanted out to see what Nika had been barking at. When I came back in to listen to the Rockies game (the wheels seem to be coming off for the Diamondbacks), you can see her petition to go outside in the photo. She can be very cute.